This may sound familiar: You need a translation, and since you don’t want to cut any corners, you opt for what appears to be a professional translation service provider. But the final product isn’t at all what you had in mind. The vocabulary doesn’t match what’s usually used in your company, the text sounds wooden and the individual words seem to have been strung together without any consideration for style. How could this happen? To avoid another disappointment and make your next translation project a success, there are a few things you should consider. First of all, you should have a clear idea of what you want from a translation. Is it purely for the purpose of understanding (“I just want to know what it says”), meaning it should follow the source text as closely as possible? Or is it going to be published? And if so, where? Can the style in a brochure be a little more creative, or is plain, matter-of-fact language more appropriate – for example in a scientific journal? Are there specific words that should be used, or avoided? In our work for the European Commission, for example, some texts come with the requirement to avoid foreign words wherever possible, to ensure that the translation is accessible to all citizens. So instead of the relatively common German phrase “Import”, it’s better to use the Germanic synonym “Einfuhr”. And Anglicisms are largely taboo, no matter how popular they may be elsewhere. For marketing translations especially, having a precise idea of the target group and taking into account particular cultural characteristics is the key to a successful rendition into another language. When translating from American English into German, for example, it’s often a good idea to tone down the typically American exuberance of the original text. If you clarify in advance what you need the translation for and who the intended readers are, you’ll save yourself time and trouble – and cash. Which service provider is right for you? Choosing the right service provider is not as simple as it may seem. To start with, you should be aware that around 70% of translators are independent freelancers, while at the other end of the spectrum there are huge translation service providers covering all the languages and specialist subjects imaginable. The choice between an independent translator, a large agency or a smaller translation company should be based on your priorities. Do you place greater value on personal contact with “your” translator, or on 24/7 availability and rapid turnaround times for large, multilingual projects? Perhaps you need to have press releases translated overnight? Or you work in an industry where accuracy is particularly crucial, such as pharmaceuticals? If this is the case, established quality assurance processes and stringent confidentiality protection will be a priority. In very technical fields, you may want to collaborate with translators who specialise in the relevant subject matter. A translator with a background in business is the perfect person to translate your annual report. On the other hand, you may work for a multinational company with a permanent presence on the international stage. In this case it makes sense to find a one-stop service provider for all the language combinations you might need, plus additional services such as proofreading or interpreting. When comparing prices from different providers, make sure that the services being offered are also comparable. For example, is revision (by a second translator and/or subject matter expert) included? Does the provider work with qualified translators? Do they guarantee consistent use of your company’s terminology? Cutting corners is never a good idea, especially if you want to publish the text. Settling for a cheap translation can easily turn out to be a false economy if your colleagues abroad have to painstakingly correct the text before they can use it. And if a translated brochure contains typos that are only spotted after printing, it can end up costing more than it would have done to buy a package of services including translation, revision and proofreading in the final format. “Translator” is not a legally protected job title, so there’s no guarantee that everyone who calls themselves a translator has had the appropriate education or training. Recognised qualifications include an MA or MSc in translation or translation studies, as well as other less well-known ones such as the Diploma in Translation (DipTrans) or the German “Certified Translator” (staatlich geprüfter Übersetzer). Membership of a professional association is also an indication, as these associations only admit translators with the relevant qualifications. Even if your company has multilingual employees, being multilingual does not automatically qualify someone to be a translator. After all, you wouldn’t let someone write your German marketing texts purely on the basis that they were a native German speaker either. During their training, qualified translators will have learnt how to apply a range of linguistic registers, how to mediate between different cultures and how to approach specialist texts. And experienced translators can work much faster and more efficiently – leaving your multilingual employees free to concentrate on their key tasks. To be certain you’re choosing the right translation service provider, you can also ask them for references. For a larger project, or if you’re looking to establish a long-term working relationship, it can be a worthwhile investment to begin by commissioning a short test translation. Misunderstandings occurring during the translation process are often caused by ambiguous formulations or inconsistent use of subject-specific terminology. For example, a German telephone service provider used to send its customers a “user name” and a “personal security code”. But the user interface then asked them to input their “access number” and “password”. Unsurprisingly, this led to a flood of customer service inquiries – resulting in significant costs. Problems like this can be avoided by closely checking the source text and providing style guides and glossaries which set out the specialist terminology used. This stage of the project can also be supported by a translation service provider. Brief your translation service provider on your target audience and the intended purpose of your text. Will the medical brochure be used for patient information, or is it aimed at doctors? Does the contract you’re having translated make reference to other contracts? If so, send these to your service provider too as reference material. If your company already has glossaries, style guides or other relevant documentation, make these available to your translation service provider – and specify whether they must be followed to the letter or are just for guidance. This way, the translator can use your preferred terminology from the very beginning and ensure their text is adapted to your company’s style. Depending on the type and quantity of the translation work, an in-person briefing can be very useful. For example, technical demonstrations or a tour of your factory could provide your translators with valuable insights which will help them to accurately convey the content of technical texts. Wherever possible, send your translation service provider editable documents rather than PDF files. This avoids the need to laboriously reproduce the layout, saving you money as well as time. Most translation companies are perfectly able to work with all kinds of file formats, from Office applications to InDesign or HTML. Like any creative work, translations turn out best when they’re not rushed. So make sure your project planning includes plenty of time for translation. As a rule of thumb, you should allow one hour for every standard page to be translated (consisting of 30 lines with 55 characters per line). 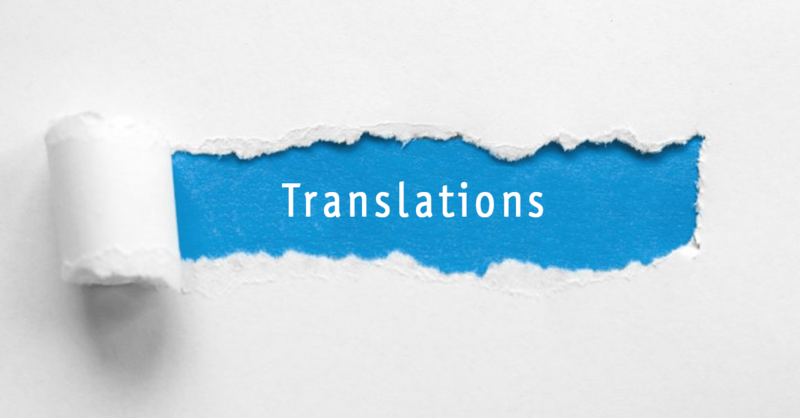 Translation companies can divide up longer texts between several translators and still guarantee consistency. Speaking of consistency: Only send completely finished texts for translation. Once the translation is underway, changing the source text involves the risk that something will be overlooked, and creates significant additional work. Making a single change to a text that’s being translated into five languages sets off a time-critical chain reaction. After you have let the project manager know about the change, she then has to pass this on to the five translators. Each of these has to send back confirmation and deal with the changes, interrupting the flow of their work. If changes are unavoidable, you can save some time by clearly marking the points in the text where you’ve made changes. It’s not unusual for a good translator to have a few queries about the text they’re working on. This may be due to ambiguous phrasing (no one reads a source text as closely as a translator! ), or a technical aspect which needs a little more context. The easiest solution is to put your translation service provider in touch with a named person at your company who can answer these questions directly. If you have a translation revised by an in-house employee, for example from an overseas branch of your company, it’s best to give them clear instructions and ask them only to make changes that fall within their area of expertise or responsibility, such as preferred product names. In some cases it can be worth putting this employee in contact with the translation service provider so that they can clarify any final questions. Providing feedback on the finished translation will help your translator to ensure you are even more satisfied with the next piece of work they send you. Be sure to inform them of any adaptations you make to the translation once it’s been delivered, so that you don’t have to make the same changes again for the next project. Translation is anything but a one-size-fits-all service. For the perfect result – a translation that meets all of your expectations – it’s crucial to ensure effective communication between the translation service provider and whoever is commissioning the translation.